This research guide contains information-- both current and historical--on the topic of intelligence. Areas covered include intelligence collection, the intelligence cycle, and also topics such as counterintelligence and cyber intelligence. 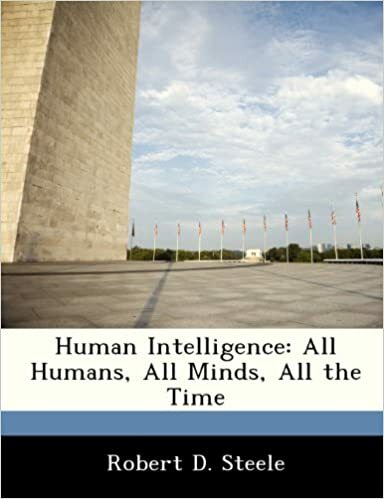 Human Intelligence (HUMINT) is intelligence gathered by means of interpersonal contact,a category of intelligence derived from information collected and provided by human sources. Aid, Matthew M. Intelligence and National Security. Vol 14, iss. 4, 1999. Musco, Stefano. Defense & Security Analysis. Vol. 33, iss.4, 2017. Jane's Defence Weekly, 14 Sept. 2001. Jones, Jerry W. Military Intelligence Professional Bulletin. Vol. 28, iss. 2, 2002. Magee, Aden C. International Journal of Intelligence and CounterIntelligence. Vol. 23, iss. 3, 2010. Innocenti, "Bill"; Martens, Charles; Soller, Daniel. Military Review. Vol. 89, iss. 3, 2009. Johnson, Loch. Comparative Strategy. Vol. 29, iss. 4, 2010. Stottlemyre, Steven A. International Journal of Intelligence and CounterIntelligence. Vol. 28, iss. 3, 2015. Baker, Ralph O. Military Review. Vol 87, iss. 2 , 2007. Barnett, Gary. Military Intelligence Professional Bulletin. Vol. 27, iss. 1, 2001. Beall, David. Military Intelligence Professional Bulletin. Vol. 35, iss. 2, 2009. Anderson, Julie. International Journal of Intelligence and CounterIntelligence. Vol. 20, iss. 2, 2007. Granhag, Par Anders; Kleinman, Steven M.; Oleszkiewicz, Simon. International Journal of Intelligence and CounterIntelligence. Vol. 29, iss. 1, 2016. Human Intelligence Collector Operations by United States. Department of the Army. Sano, John. Intelligencer Journal. Vol. 21, no. 3, Fall/Winter 2015. Ackerman, Robert. Signal Magazine. Oct 2006. Day, Dwayne A. The Space Review. Dept. of the Army. Sept 2006. How Can Human Intelligence Enhance Collection in an Era of Un-manned Technology and Reduced Personnel? Nygaard, Richard. Master's Thesis, U.S. Army Command and General Staff College. 12 Dec 2014. Brannon, Robert B. Incidental Paper: Seminar on Intelligence, Command, and Control. June 2002. Baker, W.R. Small Wars Journal. 9 May 2017. Richelson, Jeffrey. 6 July, 2015. CIA Website. 2010 Featured Story Archive. An Intelligence Civil War: "HUMINT" vs. "TECHINT"
Croston, Matthew; Valli, Frank. INSS Publications. Vol. 1, no. 1, 2017. Washington Times. 31 July 2003. Pomerleau, Mark. C4ISRNET. 25 Aug 2017. Margolis, Gabriel. Global Security Studies. Vol. 4, iss. 2, Spring 2013. Costa, Christopher. Research paper, Naval War College. 16 May 2006. Burton, Fred. Stratfor Analysis. 4 Aug 2005. Caruso, Robert. Business Insider. 8 Sept 2014.